(Fantastic Five I#2) - The Fantastic Five fought the Superoid combat android, designed by SHIELD scientist Dr. Lenny Gilcrest, in order to test its abilities. 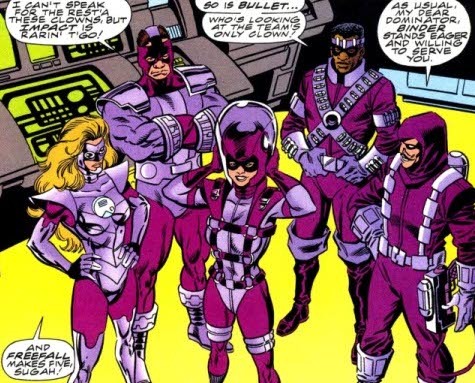 After the test, Dominator, disguised as a SHIELD agent, knocked Gilcrest unconscious, and dragged him into the control trailer, where she changed into her Warriors costume and joined the rest of the team. The Warriors planned to steal the Superoid and sell it to the highest bidder, but first decided to use it to attack the Five. In the meantime, the Wizard, directing the operation remotely, instructed Dominator to scan the area for digital transmissions. The heroes and SHIELD confronted the Warriors before they could escape with the Superoid, and the Human Torch noted that their weaponry resembled that designed by the Wizard, who had disappeared years ago. After Torus Storm (Super-Storm) destroyed the Superoid, Dominator surrounded Big Brain with a force-shield, rendering the robot temporarily inert. In order to distract the Five, Freefall then attached an anti-gravity disc to the now-conscious Gilcrest, sending him soaring into the air, and while the heroes worked to save him, the Warriors escaped. Back at their New York base, they were chastised for their failure by the Wizard, who then revealed that he had traced the signal from Big Brain back to Reed Richards' location in the Negative Zone. (Fantastic Five I#3) - From their Computer Megaverse hide-out, the Warriors and the Wizard monitored Big Brain's transmissions. The Wizard ordered the Warriors to take Franklin Richards (Psi-Lord) hostage. When Psi-Lord left the Baxter Building, and met up with Spider-Girl, the two were attacked by all of the villainous team except for Dominator, who remained behind with the Wizard, and the Fantasticar was destroyed by one of Bullet's power pellets. In the ensuing battle, however, the Warriors were neutralized and trussed up, presumably to be incarcerated. Meanwhile, Dominator and the Wizard, observing the defeat, used a dimensional transporter to follow the Big Brain signal to the Negative Zone. There, clad in space suits, they navigated to the Fantastistation, and entered it, bent on revenge. (Fantastic Five I#4 (fb) BTS) - Psi-Lord recalls the attack by all of the Warriors except Dominator; the Thing mentions that they are now in prison. (Fantastic Five I#4) - When the Fantastic Five arrived at the Fantastistation, they found that Dominator and the Wizard had already been easily subdued and held captive by the automated security systems. 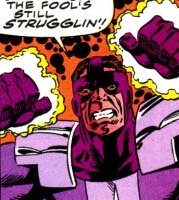 Reed Richards declared that he intended to imprison them in "cold storage." Comments: Created by Tom DeFalco, Paul Ryan, and Al Milgrom. 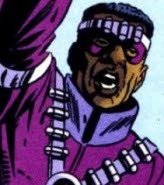 Binder was an apparently normal man who employed a costume and paste gun, supplied by the Wizard and similar to that used by the Trapster. 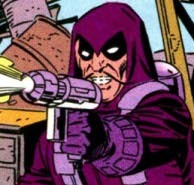 The gun was attached by a hose to a high-capacity tank of paste on his back, and could project it over a decent range. The paste was quick-drying, and could cement several grown adults quickly in place at once, and its binding effects lasted about an hour. While trying to paste Psi-Lord, he was defeated by Spider-Girl, who jammed a barrel over his head. He was then chained up, to be turned over to the authorities. Bullet was an apparently normal man who carried a number of weaponized pellets, supplied by the Wizard, in bandoliers encircling his torso, limbs, and forehead. The pellets included gas bombs, concussion charges, and high-explosive "power pellets." He was defeated when Spider-Girl swung one of his concussion charges back at him, stunning him, and allowing her to bind him up in webbing. 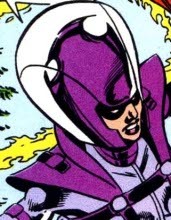 Dominator was an apparently normal woman who utilized a large helmet, supplied by the Wizard, which allowed her to produce a number of offensive and defensive effects. She claimed that the helmet was designed to duplicate and counteract the weaponry of the Big Brain robot, and it was able to fire bolts of force, as well as project force-fields that disrupted communications signals. She was the Wizard's second in command, running the Warriors team at his behest. 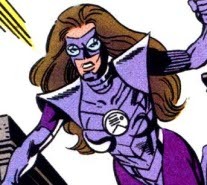 While trying to steal the Superoid, she posed as a SHIELD agent, and revealed that she was once in fact an actual member of the agency. After the other Warriors were defeated by Psi-Lord and Spider-Girl, Dominator accompanied the Wizard to Reed Richards' Fantastistation base in the Negative Zone. There, she and the Wizard were both easily subdued and held captive by the station's automated security systems, and incarcerated in cold storage by Reed Richards. Freefall was an apparently normal woman who employed a number of anti-gravity disks, supplied by the Wizard. She used one of the disks to fly, and attacked by hurling others at her opponents; on contact, they would bind to the victim, sending him or her hurtling into the sky and, if not rescued, into near-Earth orbit. She could also attack by projecting anti-gravity fields from her gauntlets, lifting opponents from the ground. She spoke with a strong Southern accent. She was defeated while pursuing Spider-Girl through a junkyard; the heroine lured her between two large piles of scrap metal and pulled them down on top of Freefall, trapping her. Impact was a heavily muscled, but otherwise apparently normal, human being who employed a pair of power gloves supplied by the Wizard. The gloves increased his strength, and made him a formidable hand-to-hand combatant. He spoke in a thuggish manner, and seemed very hot-headed. He was defeated when Psi-Lord used Binder's paste-gun against him, gluing a bunch of scrap metal to his frame and then immobilizing him using a large crane magnet.